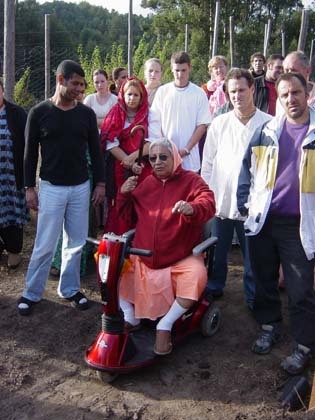 Every morning, Srila Gurudev looks out his window, and if the weather is nice, he will go out for a ride on his Scooter. 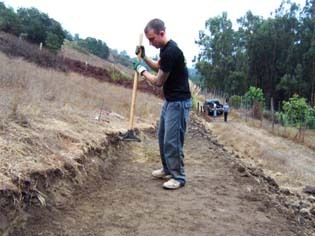 Recently, he said that he wanted a road to the top of the mountain so he could see the ocean. 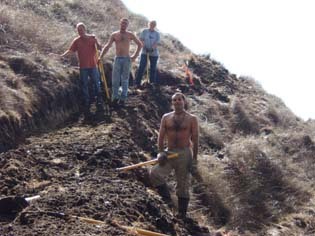 So Hasyapriya Prabhu organized a crew to build a road that snakes up the side of the hill. 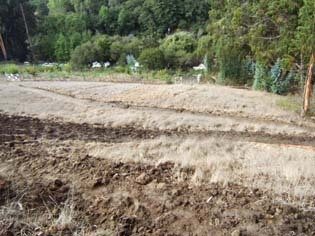 This is the hill that the devotees are digging on: a lot of dry grass, a very steep slope, and slippery all the way up. 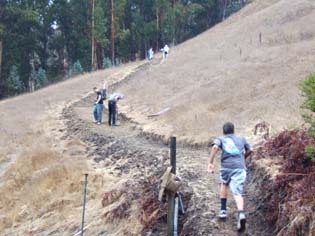 As a kid, I would always climb the hills and explore the different trails, but it was impossible to reach the top on this side. 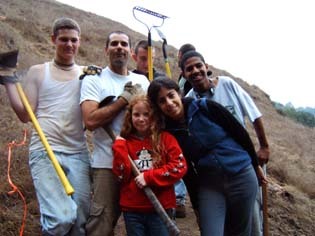 Here are several devotees that helped on the first few days of construction: digging, picking, hacking, and raking the dirt. 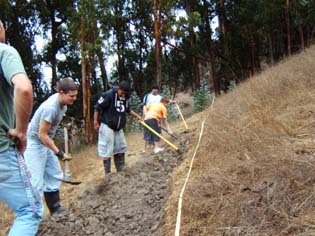 The first step was to plan the structure of the road, which turns it would need to safely reach the top. 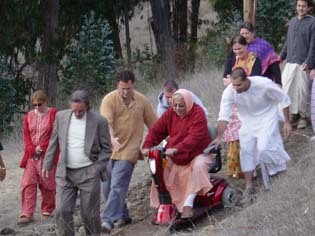 Second was to create a four-foot wide path for Gurudev's scooter and the line of devotees that would follow him. 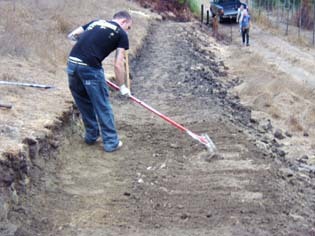 ...then packs the dirt with a heavy weight to flatten it. 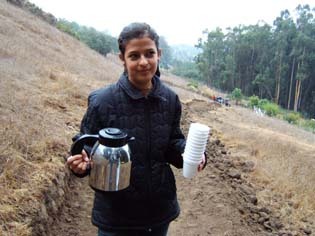 Lalita Didi from Mexico brings us lemonade and sweets. The road makes more progress everyday! 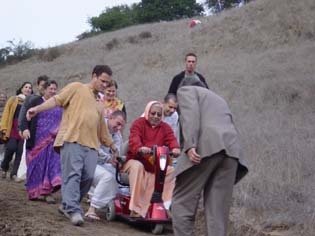 Srila Gurudev refers to it as the "golden road." 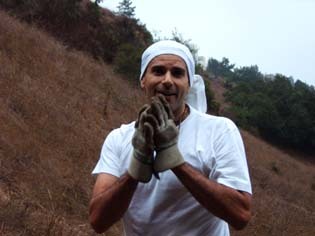 Isvara Prasad Prabhu from Venezuela is visiting for a few days and dedicates all his energy to Gurudev's instructions. 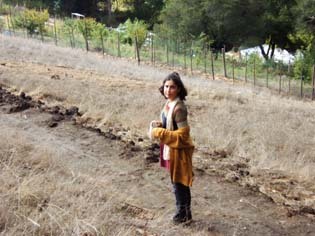 Meanwhile, the new road is also a great place to take japa walks. Krishna Kanta Didi has the right idea. 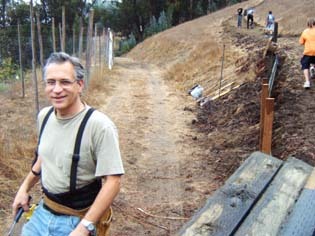 Within four days, we are almost to the top of the hill. 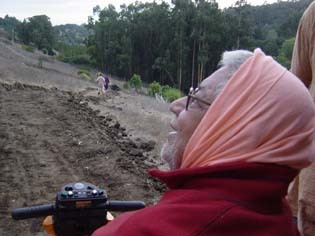 Srila Govinda Maharaj comes out to explore the new road. Making sure the scooter won't tip. 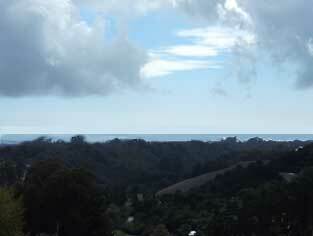 ...the view of the ocean from the very top.